Jubilee’s produce is available through its Community Supported Agriculture (CSA) subscription program, in which members of the public support the farm by committing to purchase shares of its produce for a season. 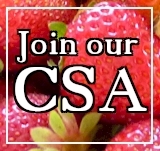 By being a member of our CSA, not only do you enjoy fresh, local and seasonal food – but you also get to engage with the land & the people that provide that food. Hi this is Janelle Kelly. I am wanting to sign up but your sight is down for sign up. Wanted to be able to pick up today but it’s a little late now lol. I’m looking at the fall session and don’t know the difference between 3/4 and full share? And it seems like it’s all just pick up, do we not help harvest in fall and winter? Sorry if the answers are here somewhere else! During the fall, winter, and spring, we don’t have on-farm pick-up available but instead offer delivery to various depots throughout Seattle and the Eastside. Because we farm in a flood plain, these off-season months often see flooding and road closures, making trips to the farm a bit more unpredictable.